I've had this recipe bookmarked in my dog-eared copy of Andrea Chesman's excellent Recipes from the Root Cellar for about six years. But now that I've finally made this lovely lasagna, I will be making it often. It's a perfect winter meal - elegant and hearty at the same time. 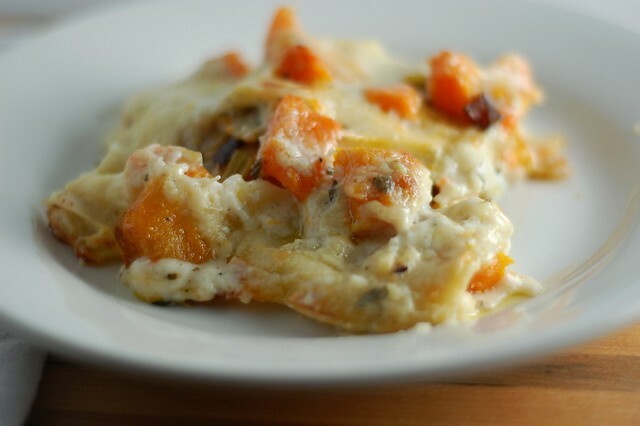 The combination of sweet, nutty roasted squash, mellow leeks, sage and garlic-infused béchamel, and gooey, melted Parmesan cheese makes it very hard to stop eating... In fact, next time, I will get out my HUGE lasagna pan and double the recipe to ensure leftovers. 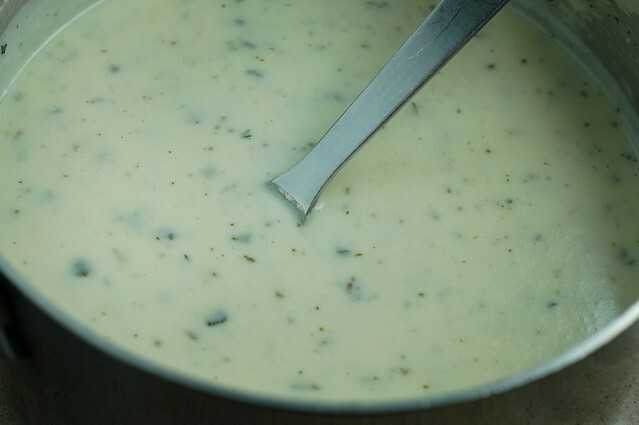 Please do NOT be intimidated by the fancy-sounding béchamel sauce - it's not hard to make. Once you've made it once, you'll realize there's nothing to be scared of, even if it does sound frighteningly French. 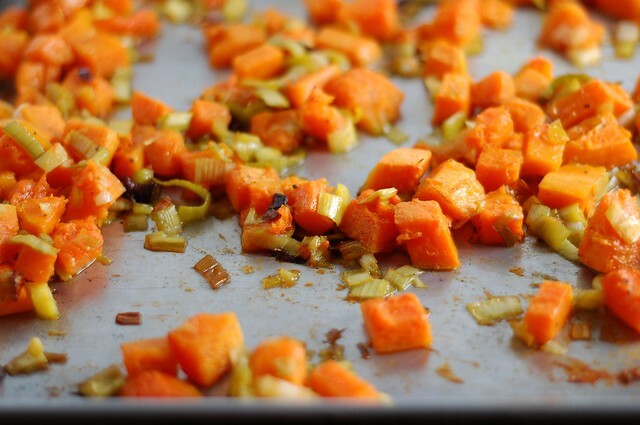 You start by roasting butternut squash and leeks until they're soft and caramelized. While the vegetables are roasting, you make a garlicky roux by sautéeing garlic in butter then stirring in the flour and browning it for a couple minutes. 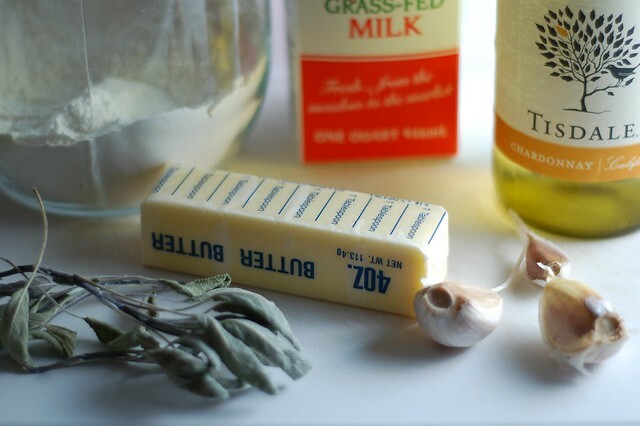 Then you turn that roux into a béchamel by whisking in several cups of milk, bringing it to a boil briefly and adding the dried sage and white wine. It should thicken up nicely. 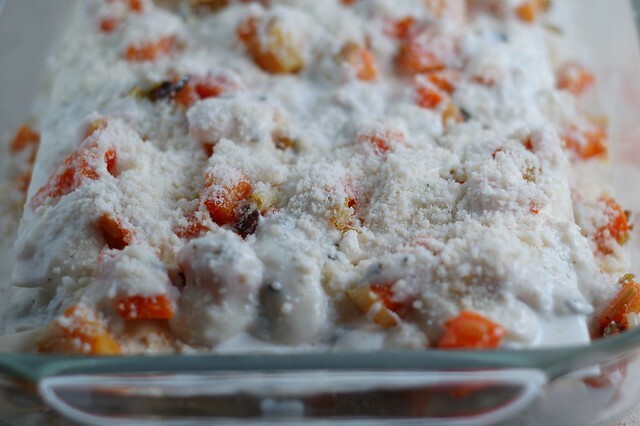 Assembly is easy, just schmear some béchamel in the bottom of the pan, put a layer of lasagna noodles (I used no-cook) over it, do another schmear, top with a layer of roasted vegetables and a blizzard of Parmesan cheese and repeat as many times as you have ingredients for. Cover with tinfoil and bake for half an hour, then remove the foil and bake a little longer to achieve maximum bubbling and browning. Cut and serve with a salad and some bread. If you don't already have a copy of Recipes from the Root Cellar , I encourage you to get one! It's one of my three most-used cookbooks along with Deborah Madison's Vegetarian Cooking for Everyone and the good old Joy of Cooking . 1. Preheat the oven to 425. 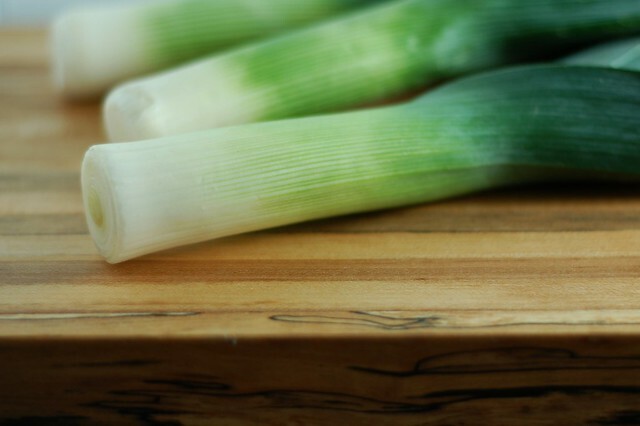 Mound the squash and leeks on a baking sheet, drizzle with the oil, salt and pepper and toss thoroughly with your hands until everything is well-coated. Arrange in a single layer and bake, turning once or twice to avoid burning for 25-30 minutes, until the vegetables are tender and browned. Remove pan from the oven and lower the heat to 350. 2. 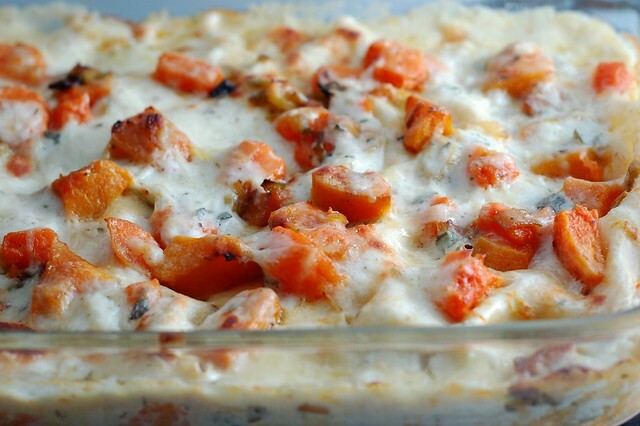 While the veggies are roasting, make the béchamel sauce. Melt the butter in a saucepan over medium heat, add the garlic and cook until fragrant, about two minutes. Whisk in the flour to make a smooth paste (a roux) and cook, whisking constantly for about one minute. Add the milk and whisk until smooth. Bring to a slow boil, stir in the wine and sage and season with salt and pepper. Remove from the heat. 3. Assemble the lasagna: spread half a cup of the béchamel in the bottom of a 9- by 13-inch baking dish. Lay three noodles over the bottom of the pan. Pour more of the sauce over the noodles then top with a third of the roasted squash and leeks and a quarter of the Parmesan cheese. Repeat until you've used up the veggies and noodles. Spread the remaining sauce and sprinkle whatever cheese you have left on top. 4. Cover the pan with tinfoil and bake for 30 minutes, then remove the foil and bake for another 10-15 minutes to brown the top. 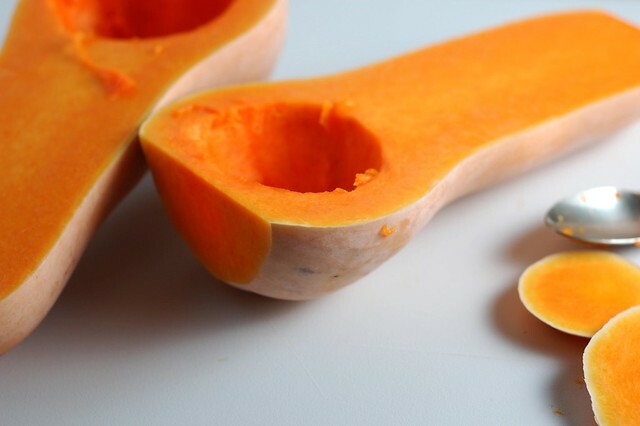 Remove and let stand for five minutes before cutting and serving.